I want to go to Phuket. James doesn’t like to watch T.V. The structure of noun phrase in Thai is “noun + adjective” always!! She wants to eat spicy chicken. ค่ะ /kà/ is a polite particle used by female speaker, at the end of statements. It is usually used when talking to a stranger, and older person as a sign of politeness. Thai people don’t commonly use it when speaking to friends. Some men use ค่ะ /kà/ when speaking to younger female or loved one. คะ /ká/ is a polite particle used by female speaker, at the end of questions. The same usage as ค่ะ /kà/. ครับ /kráp/ is a polite particle used by male speaker, at the end of both statements and questions. 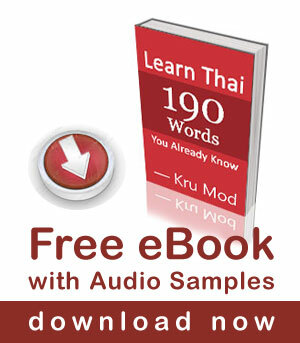 In spoken Thai, the r is typically dropped and ครับ /kráp/ becomes คับ /káp/. Some females use ครับ /kráp/ when speaking to young boys. ครับผม /kráp pŏm/ used by male speaker only. It is used alone as a ‘yes’ response. It is often used humorously as a sign of being over polite. จ้ะ /jâ/ is a friendly particle mostly used by adult female speakers at the end of statements when speaking to friends, younger people and people of inferior status. Some males use it when talking to females as a ‘sweet-talk’. จ๊ะ /já/ / is mostly used by adult female speakers at the end of questions. The same usage as จ้ะ /jâ/. ฮะ /há/ is used by young boys in informal situation or tomboys. อ่ะ /à/ is used by male and female speakers as an informal substitute for the above polite particles. It is used to indicate intimacy with sibling, my close friends of equal status. วะ /wá/ is impolite particle used by male and female speakers. It indicates rudeness and aggressiveness when speaking to people you don’t know well, at the end of questions. It is fine to use it with very close friends. For example; ทำอะไรอยู่วะ /tam à-rai yùu wá/ What the hell are you doing? หวะ /wà/ is impolite particle used at the end of statements, to express opinion or feeling. เว้ย /wèoi/ / is impolite particle used at the end of statements, it is more aggressive than หวะ /wà/. ยะ /yá/ is impolite particle used at the end of questions. It is similar to วะ /wá/ but only used by female speakers. It is ok to humorously use with friends. ย่ะ /yâ/ has the same use as ยะ /yá/ but it is put at the end of statements. นะ /ná/ is a friendly informal particle, it is used when telling something to someone directly. I’m guessing that the copyright violations were not sorted out? Hello Mod :), the video is not working..
Sawatdee ka, my YouTube channel has been suspended at the moment. I have already submitted the copyright counter notification to YouTube, my channel will come back up in about 4 weeks.